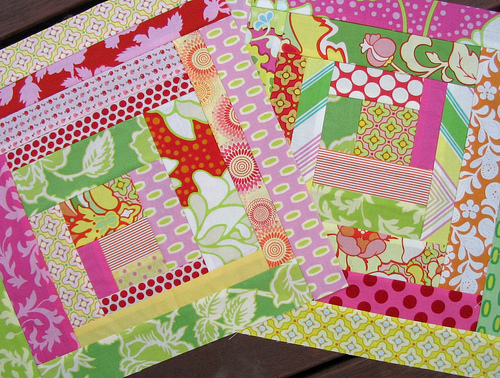 I am participating in the Around the Block Swap, which involves making patchwork blocks for a participant, from fabrics that they have sent to you. For the month of October Louise requested 12.5 inch blocks, and improvisational piecing without any wonkiness. Phew! Wonkiness is hard for me! 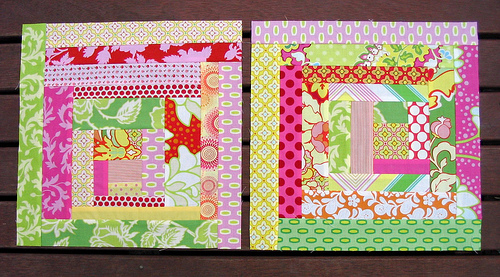 These blocks were a lot of fun to make; pieced without any pre-planning. Just plain fabric play. Louise supplied the fabrics, most of which are from Heather Bailey's Pop Garden range, and I adore each and every one of them. I love how these blocks turned out and was quietly surprised by how much I enjoyed the improvisational piecing! These are my favorite colors! I just love them!! You must have been so thrilled when you opened the parcel to see such wonderful fabrics to play with. Very, very cute! Louise is going to love them!!! Beautiful blocks, I'm sure she will love them!! What a great idea - they look wonderful, Rita! Gorgeous blocks Rita...and I'm with you re: Wonky!! Gorgeous blocks!!! I love Heather Bailey's fabrics. I'm terrible at wonkiness too.. it has to be a very conscious effort when I have to do it. Louise has lovely taste in fabric and lucky to have you on her block! Beautiful job. Wonkiness and improvisational piecing - they are both quite scary terms to us perfectionists! You've done really well - beautiful blocks. So does improvisational piecing mean you don't match fabrics? You just cut them all to certain lengths (is this block a log cabin block?) and then piece with whichever one comes up next? I know I must sound so stupid, but so new to this quilting gig I'm still trying to get the lingo. Wow! They turned out gorgeous! I adore this fabric line by HB too! Well done, and Louise will surely love your blocks!